Something special happens when you take healthy in-season Fall/Winter vegetables and give them a light drizzle of olive oil and a sprinkle of sea salt and place them in the oven for about ½ hour. Out pop the most delicious slightly caramelized but still perfectly fork tender roasted veggies. Add a few candied (or raw) pecans and a few dried cranberries and it’s a Fall/Winter party on a platter. 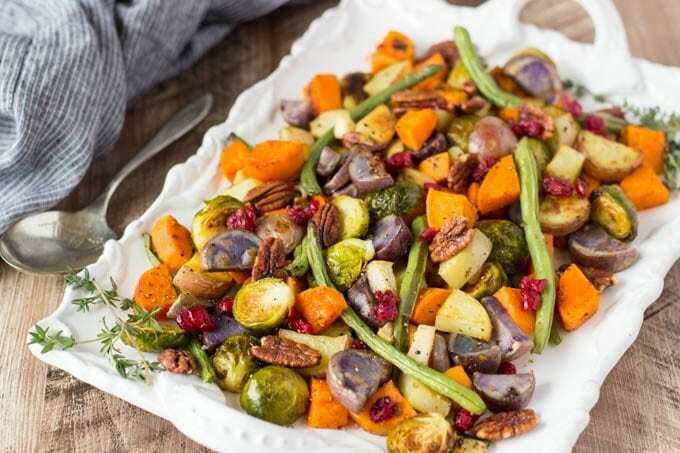 If you don’t have enough oven space to roast the veggies at the same time as the rest of the holiday meal , this dish can be prepared up to one day ahead of time and reheated just prior to serving. In fact, when you pull the turkey out of the oven to let it rest (and be carved ) put the veggies in the oven to warm up. Or to make things really easy…serve these roasted vegetables at room temperature. They are equally as delicious! 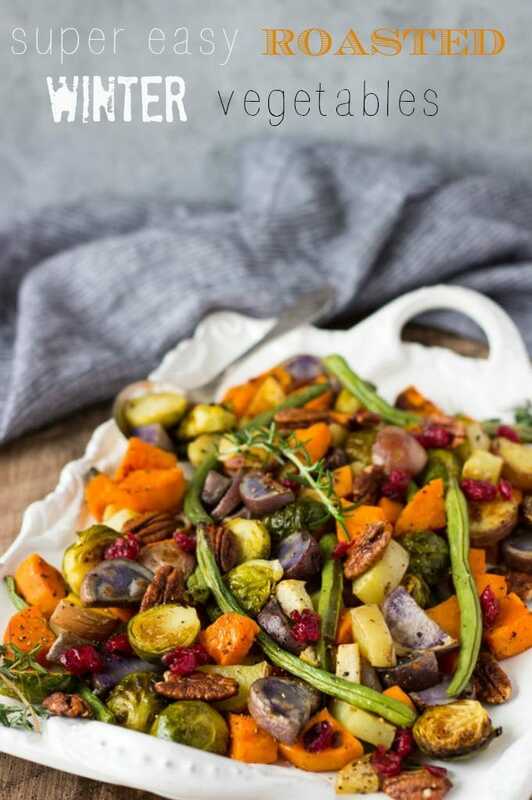 As fabulous as these roasted winter vegetables are for your holiday meal they are so super simple to prepare you can whip them up any day ! I’m a bit obsessed with roasted winter vegetables at the moment. I just have to laugh because this is SO me…I find something I really love and I make it over and over and OVER! Until something else catches my fancy and then I’m hooked on that and make it over and over! So my November ” crush “ has officially been roasted winter vegetables. I like to make a big batch so I can have some on hand to make healthy lunches to take to work. You can take your salad game to a whole new level by topping your favorite greens (like arugula or kale) with some quinoa and a roasted winter vegetables (more on that soon). Also DE-LICIOUS…make a wrap with hummus, roasted winter vegetables and a handful of salad greens (OMG!) . Today I put them in my egg white omelet with some spinach and a dash of sriracha ..so many options! That is if they even make it off the sheet pan! Warm, right out the oven , little bites of HEAVEN! Just wait until you taste these beauties…I think you just might become obsessed too! 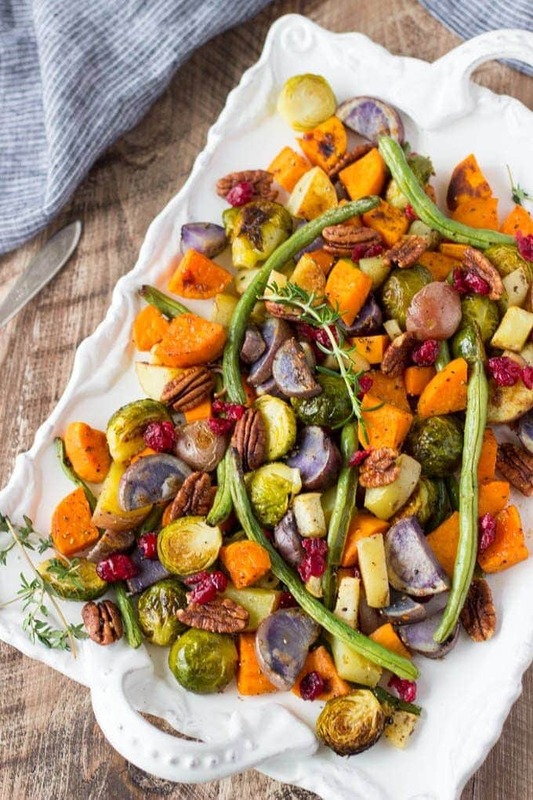 Looking for Healthy Holiday Side Dish ideas? Super easy sheet-pan roasted vegetables. Winter/Fall favorites like sweet potatoes, Brussels sprouts, green beans, apple, and baby potatoes. A perfect side dish for Thanksgiving or any day. Combine sweet potatoes, Brussels sprouts, green beans, apple and shallots in a large bowl (or ziplock bag). Drizzle with olive oil and toss to coat. Line a baking sheet with aluminum foil. Spread vegetables in a single layer on baking sheet, leaving a little room around each vegetable ( you may need 2 baking sheets). Sprinkle with salt and pepper to taste. Bake until vegetables are tender enough to pierce with a fork and have some charred bits on the edges ( approx. 25-35 min). Use a spatula to flip vegetable mid way through cooking. Transfer to serving dish and top with pecans and dried cranberries. ** These roasted vegetables are equally as delicious served at room temperature.